MANCHESTER, NH. 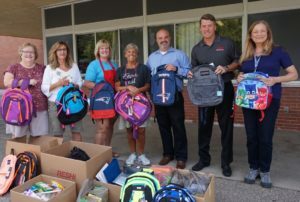 (August 30, 2017): EPE Corporation, a high-reliability Electronics Manufacturing Services (EMS) company, has organized a Backpack & School Supplies Drive to benefit Jewett Street Elementary School in Manchester. This second annual Backpack and School Supply Donation Drive is part of an ongoing community-oriented campaign celebrating EPE Corporation’s 50-plus years in business. This donation drive is just one of many events EPE Corporation organizes throughout the year in order to support its community. EPE Corporation has been a trusted, high-reliability Electronics Manufacturing Services (EMS) expert since 1965. EPE is a Service-Disabled, Veteran-Owned Small Business (SDVOSB) located in Manchester, NH and focuses on the high-reliability markets of defense, aerospace, medical, robotics, industrial and RF Communications. To find out more about EPE Corporation, please call 603-669-9181 or visit our website at www.epecorp.com. Posted in Home Page News, Press Release.